BlackBerry Classic Non-Camera Launched Officially! Many of you have asked whether BlackBerry will have a non-camera variant for the BlackBerry 10 line. Well, it seems the answer is answered now, yes! 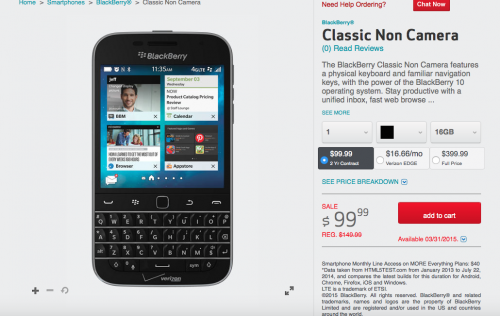 Over in the USA, BlackBerry has launched the BlackBerry Classic Non-Camera exclusively on Verizon. Now the device will be available in stores starting March 5th, but you can grab yours early by ordering from the site, if you are a Verizon user in the USA. If you’re looking to go no contract of any sort you can grab it for full retail a USD$399.99. Category: BlackBerry 10, BlackBerry Smartphone, Classic, Everyday life, News! I believe the verizon version will work with 3G only and not on LTE? Will you be bring in and if yes, what will be the price and whether it comes with white and blue? looking to get these two colors.